Have you ever wondered how much money exists on the the internet? The rate at which money can be made online has increased massively. But, with so much money on the internet how come so many people with laptops, internet enabled phones and basic internet skills are still broke? The answer is they lack information, yes! now wonder there is a popular saying that if you are not informed you are deformed. The internet has today turned the world to a global village through various social media platforms, online search engines and forums. Still, many are confused on how to tap into this great opportunity the internet provides to make money online. To be sincere, it's not really very easy to make money online. This is no cake walk with so much competition on the internet by those seeking relevance and the attention of people online. The quest to find reputable means of making money online is increasing by the day but the fact remains 30% of these opportunities remain untapped. Most times, we meet some 'self styled' internet marketers online whose intentions are to collect the little you have instead of helping you make more. Do not fall for ponzi schemes scam, networking scams and pyramid schemes because are being scammed by the day. I know you want to ask, how then do we make money online? What am about telling is not just to generate a few notes for you, but could make you wealthy in a few years times. The internet has given us the opportunity to invest in and create wealth. Just before we go further on ways in which you can make money online, I have to tell you that building an online authority involves pain, but after these pain comes the gain. So many fail to scale through this and end up being unable to keep up with the pains of making money online. Wen you hear people making money online genuinely you may think its as easy as eating a pie. But according to R.L ADAMS, in order to make serious amounts of money online, you need to the most amount of work for the least initial return, not the least amount of work for the greatest return. 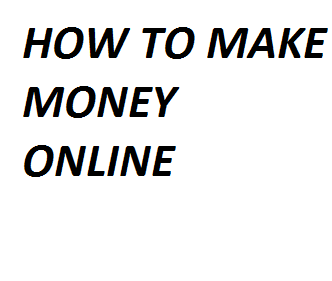 Since you now understand where am coming from let me now tell you the easiest ways you can make money online. One of the attributes you need to possess as someone who wants to earn an income from the internet is 'passion'. Remember, making money from any form of activity whether on the internet or physically involves adding value and solving people's problems. Focus on solving problems rather than how you can easily make short term money. CREATE A BLOG: Before creating a blog you have to find out what you are good at or passionate about that you can write exhaustively about. This is called finding your niche, you dont have to be a pro from the start but you must be willing to learn and improve fast. Now, you should know that your blog is your business online. This is where people who are interested in what you have to offer find solution to their problems online. Remember to create your blog on a custom domain name as this makes it more professional (example is www.yourbiz.com). The next thing to do is to be creating unique and rich contents for your blog visitors. No wonder there is a popular saying online that 'content is everything'. Rich content transforms to authority online. Like I said, don't be too interested in making money rather build an online profile. Don't start pursuing online Ads networks when you are yet to build a massive follower-ship. you will need to write and market them too. One easy place to look for jobs online is Amazon's mechanical Turk. There are lots of little jobs out there you can do for people and earn a few extra cents. These jobs are called Human Intelligence Tasks. Are you a web or graphic designer? or do you have any other technical expertise? Then fiverr is for you as you start making at least $5 online when you offer gigs. Visit fiverr and learn more about the services you can offer to people and make sure to make your profile professional. If you are really interested in making money online then you can't brush this aside. If you have a loyal and interested email list then you have a gold mine here. Why waste those beautiful selfies on social medias alone? Also are you a pro photographer? Istockphoto and SHUTERSTOCK offers a platform where you can sell your nice photos online and earn good money. If you have a product or services you have to sell then consider building an online store. Shopify offers the platform to build an online store where transactions can be made. You can take online surveys and earn a little extra income online. You can also answer questions online. Other ways you can make money online is buy teaching others online and write articles for people. When it comes to writing articles online you have to create a very professional online portfolio. I hope this was successful, if yes please share to your friends.